At what point do we realize we’re living int he Twilight Zone? U.S. officials, meanwhile, said that the bombing suspects’ mother had been added to a federal terrorism database about 18 months before the deadly attack — a disclosure that deepens the mystery around the Tsarnaev family and marks the first time American authorities have acknowledged that Zubeidat Tsarnaeva was under investigation before the tragedy. The news is certain to fuel questions about whether the Obama administration missed opportunities to thwart the April 15 bombing that killed three people and wounded more than 260. Tsarnaev is charged with joining with his older brother, now dead, in setting off the shrapnel-packed pressure-cooker bombs. The brothers are ethnic Chechens from Russia who came to the United States about a decade ago with their parents. Investigators have said it appears that the brothers were angry about the U.S. wars in Afghanistan and Iraq. 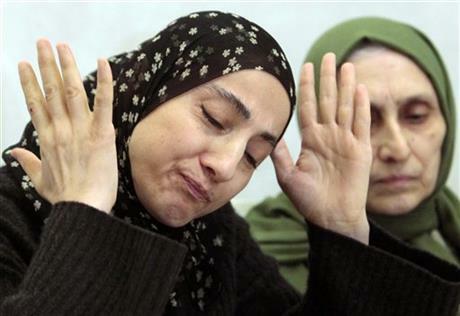 Two government officials, speaking on condition of anonymity because they were not authorized to speak publicly about the investigation, said the CIA had Zubeidat Tsarnaeva’s name added to the terror database along with that of her son Tamerlan Tsarnaev after Russia contacted the agency in 2011 with concerns that the two were religious militants. This would all be rather hilarious if we didn’t have four people dead and over 170 people injured. In fact, it would be a bigger knee-slapper if we didn’t have to remember names like Abdulhakim Mujahid Muhammad, Najibullah Zazi, Nadal Malik Hassan, Umar Farouk Abdulmutallab (who could forget our beloved underwear bomber? ), and Faisal Shahzad. Pretty soon there will almost be enough terrorist running around on American soil to put them in their own version of “Real World.” Perhaps it will air on Current TV. Who wouldn’t be interested in following the exploits of the underwear bomber, who is looking for love but having a tough time since he incinerated Allah-his family jewels? Low blow? Don’t blame me. He was the one who tried to kill Americans over the Christmas holidays by detonating plastic explosives in his underwear. Remember when we were told that authorities didn’t know who perpetrated the April 15 terror attacks in Boston, and then millions of Americans started looking at online images to find suspicious people, sending in cell phone images to the FBI and trying to do the right thing? I do. But it turns out that the Department of Homeland Security, the FBI and the CIA had a very clear idea of who to look for within minutes. They had to, because an entire family of welfare-collecting psycho-jihadists were on their terror lists. Got that? Taxpayer subsidized jihad, courtesy of the state of Massachusetts. It’s now possible be on a terror list and a welfare role at the same time. Is it possible that maybe — just maybe — the government is too big and doing too many things if these are the types of scenarios we are finding ourselves in? The United States now has the sad distinction of having brought over immigrants, who then attended radical mosques, collected welfare, got put on terror watch lists, and ultimately killed and maimed innocent Americans. Imagine, if you will, that George W. Bush was still president. What do you think the media landscape would look like? Welcome … to The Twilight Zone. Previous Entry Is George W. Bush smarter than you? The better question: Is he smarter than the media? Taxpayer subsidized jihad….boy that sounds bad, and is bad in Barack Obama’s America. Twilight Zone is one word for it….. This whole story is mushrooming around BHO — why didn’t he do more to prevent an attack by known radical Muslims inside the USA — and this is a healthy inquiry. If it also leads to inquiries around welfare and immigration, then we’ll know the country isn’t quite vanquished by Liberalism just yet.